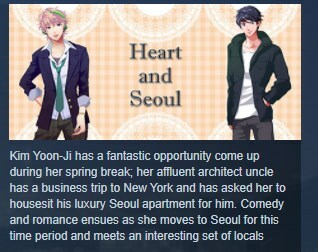 Kim Yoon-Ji has a fantastic opportunity come up during her spring break; her affluent architect uncle has a business trip to New York and has asked her to housesit his luxury Seoul apartment for him. Comedy and romance ensues as she moves to Seoul for this time period and meets an interesting set of locals who proceed to show her around! What will happen next? It’s up to you! Live out this charming romantic comedy Otome visual novel and see if you can find your Seoulmate! ★ A fun, light and comedic storyline. ★ An entertaining and addictive mini-game.